Because I had a limited budget ($100), I knew I wasn’t going to replace the shelf. I, instead, wanted to create an overlay that would mimic a wood shelf. Initially, I thought we’d cut a large piece of plywood down to size, but it was expensive. (You pay for the whole piece, unless you can find something in the scrap pile for 70% off; which I could not). 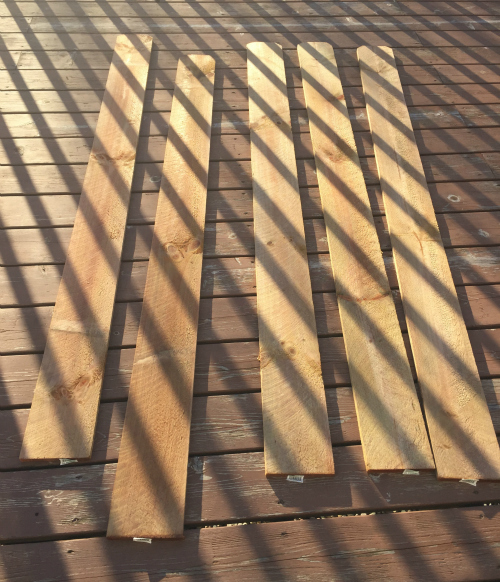 We found some cedar fence posts; they are lightweight and $2.25 per post (we needed 5). 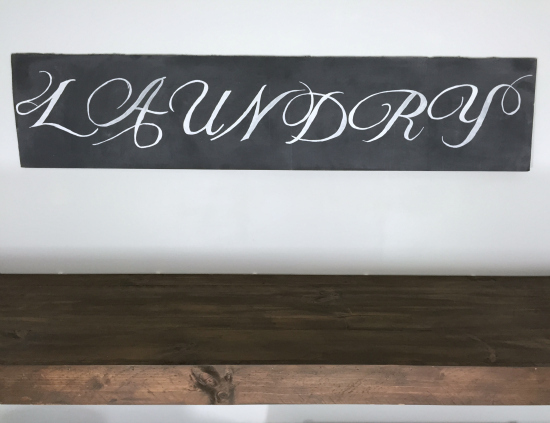 Our shelf was 71″ long, and the posts were 72″ (perfect because there was 1″ cutout at the top… great for a picket fence, not great for a shelf). When we bought the posts, they were really wet, so we laid them out to dry. 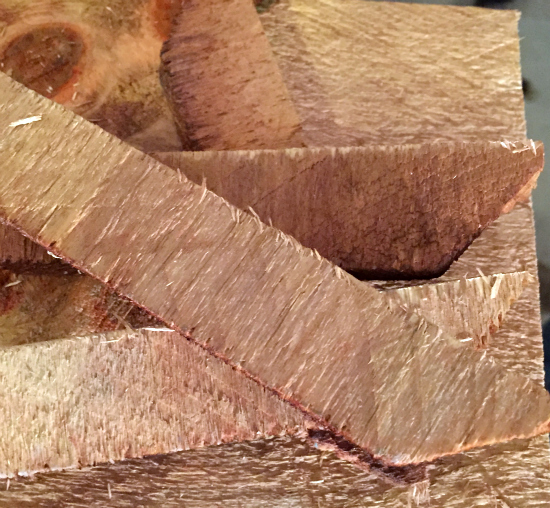 As noted, we cut off one inch from the tops of the posts, where they were angled. 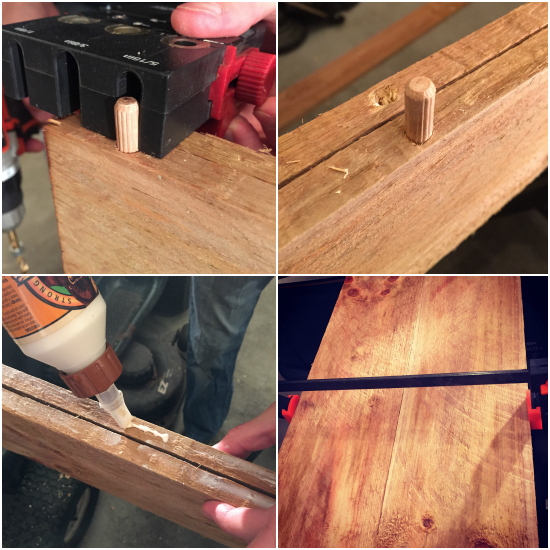 We then used 5/16″ dowels and wood glue to attach 4 of the posts together (our shelf was 20″ wide, and the posts were each 5 1/2″ wide). Please Note: You will need a dowel jig for properly placing the wood dowels and clamps to hold the wood pieces together while the wood glue dries. 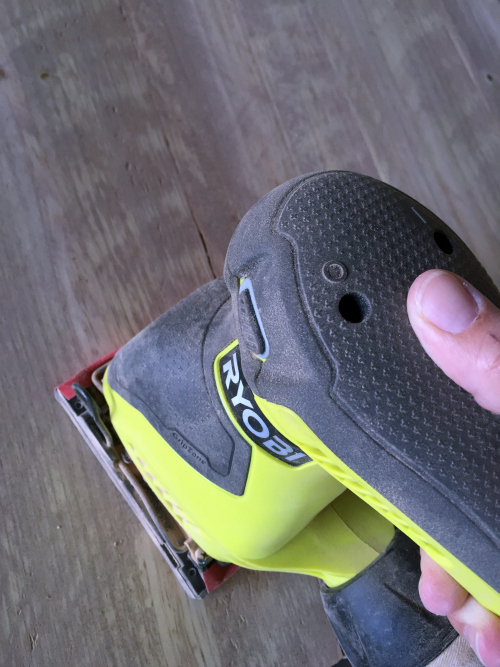 After the glue had completely dried, we sanded the boards down with our Ryobi Orbital Sander, starting with an 80 grit sandpaper, and working up to a 220 grit. Once everything was good and dry, I stained the shelf in the color kona. 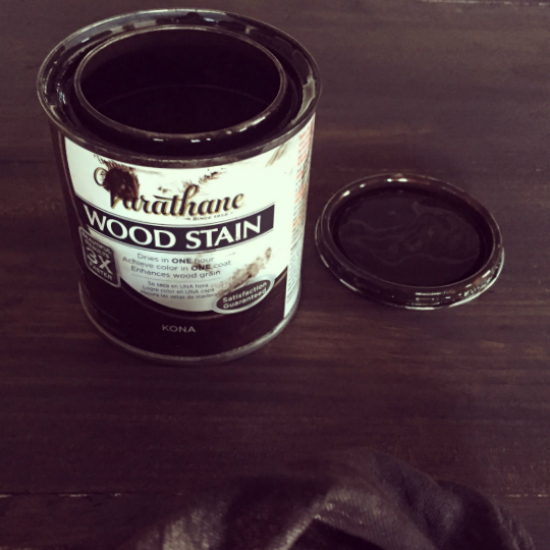 We allowed the stain to thoroughly dry and applied a couple coats of polycrylic. I brought the shelf upstairs and laid it on top of the wire shelving, and that was all there was to it. In the picture below, you can see how the wood overlay sits on the wire shelf. I did spray paint the support, as you can see. I thought the white would look funny, so I removed the support and sprayed it with hammered metal spray paint. I just love how this turned out!!! 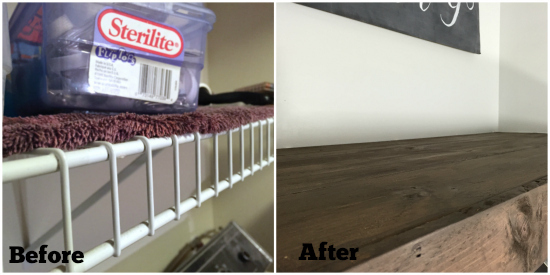 Goodbye wire shelving, hello beautiful wood shelf!!! If you have any questions regarding this tutorial, please feel free to ask away! 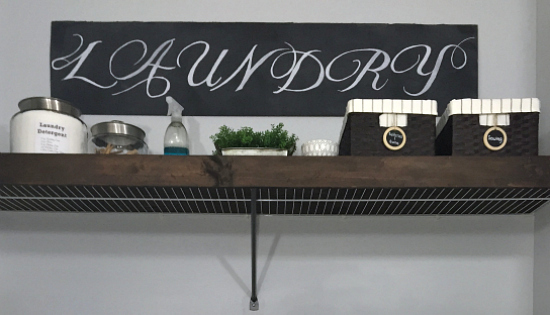 You can see the whole Laundry Room Reveal HERE. I hope you all enjoy this upcoming week! This is great! I have seen the closets redone like this but that is over the top in my opinion. 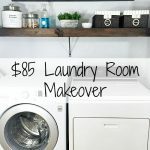 However, I have almost the exact set-up in my laundry room and would love to update it! Thanks for the DIY inspiration. Absolutely love this idea. It will be made for my house for sure. Wire shelving is the worst. This looks awesome, particularly the detail of painting the white support. I wish I would have thought of that. Instead, we built a shelf with the front lip (I did have some leftover plywood which is only about $32 a sheet) and used two 1.X4 attached to the wall on each side. This is one of the best, most amazing things I have ever seen. Thank you, thank you, THANK YOU!!!! I have spent hours trying to cover the too expensive wires from container store in our kitchen, laundry area and back work area. (That’s where my husband and I each get a side, but somehow his stuff migrated. He thinks 10 years taxes belong near CF bulbs.). I’ve tried magnets. I like this. How did you get it to stay on? Or I can just ask someone. This shelf actually isn’t attached to the wire shelving at all, it’s simply set on top and resting on the old shelf. I absolutely love this idea! So smart! definitely pinning to remember this one! Thanks for sharing Kristen! Have a wonderful day! So smart! What else can I say? 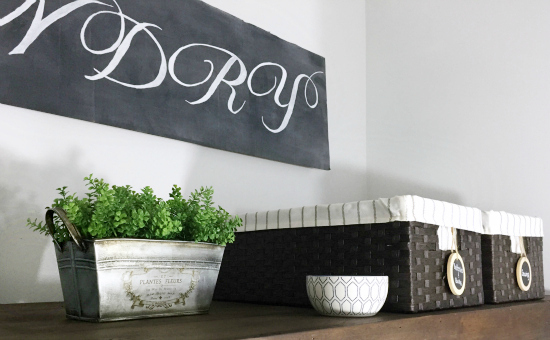 I love this project & would like to give it a try but I have never worked with dowels before. What kind of dowel tool would I need and one that would line up the dowels from one post to the other? Thank you Erin, We were able to find what we needed. It took a bit before we figured out how to use the dowel jig but we are just finishing up our first project with it. Before the next one I will be sure to check out the video. Thanks again. Awesome! Glad you were able to figure it out. Erin I have the exact closet shelf and am doing this today!! can you still hang coat hanger on the rack? maybe add an extra slat so it sticks out farther? Wow, it looks great! What a great and economical idea. Thanks Liz! 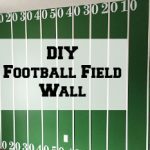 This was a really fun project that completely changed the look of the space. Thanks Cheri! Sounds like you’ll be able to create something with all that wood. Good luck with the laundry move. I was glad to come across your website. I have seen your shorter version showing the wood-covered wire shelf and was amazed. I’m surprised the wood is not too heavy for the wire supports. Did you have to add any extra bracing? I also like the fact that when the bottom of the wood was painted the wood color, it made a nice pattern on the bottom. One more question. 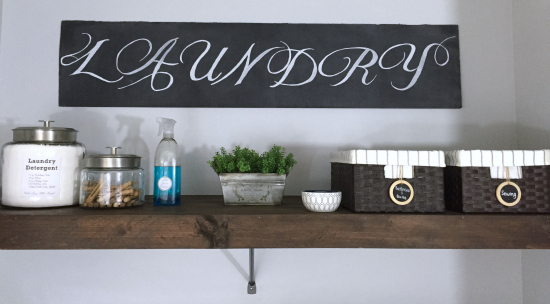 Where did you put the detergent, fabric softener, bleach, and other necessary stuff? Thanks very much for this article. Thanks for your questions. 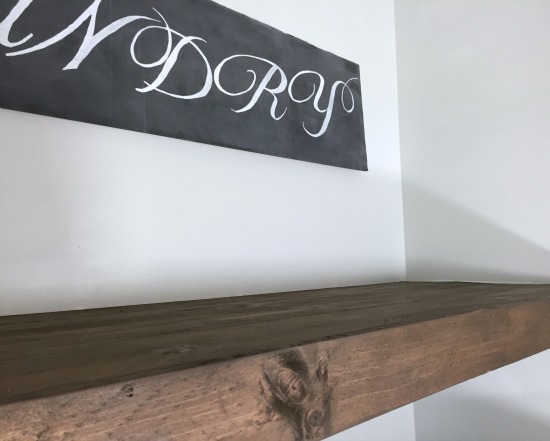 About the wood overlay; we used cedar, which is a very light-weight wood, so it does not add a lot weight to the shelving, and because the weight is evenly distributed across the shelf, we did not add any additional brackets for support. As far as where I put all my stuff… The laundry detergent you see in the befor pictures was almost gone. I decided to DIY my own version (which was powder), so it’s in the big glass jar. Most of the other things that were on that shelf (static guard spray, my sewing kit (that small bluish/purplish tote), dryell, etc.) 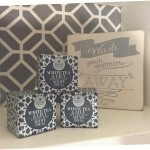 went into the baskets that are now on the shelves. I moved my bleach down to my cleaning closet because I never actually use it for anything expect cleaning up after the stomach flu. Hope that answers your questions. Erin, it is such a small detail but it makes such a difference. Really nice idea! Because a finished room is in all of the details. Wow, what an improvement over the wire shelving. It looks custom and gotta love free! Pinning! Honestly I was searching Pinterest just last week for ideas to make our wire shelves (in our walk in robe!) look and function better. I love this, thank you! You are so welcome! Glad you like it! Hope it works well for you if you decide to go this route! Erin, this is amazing! Just…WOW! Why have I never thought of this?! I ask myself that same question every day when I see how creative other people are. It’s amazing what you can come up with when you have a limited budget. And thankfully I had my hubby with me to point out how well the cedar posts would work. I would have never thought that started as a wire shelf! I may have to steal this idea! What a great idea!!! I have a few places where I would love to do this!! I know! 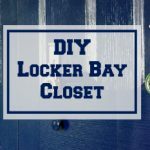 We have wire shelving in our closet and it always leaves ridges in our clothes, so we’re thinking of doing this in there too. I LOVE this idea! 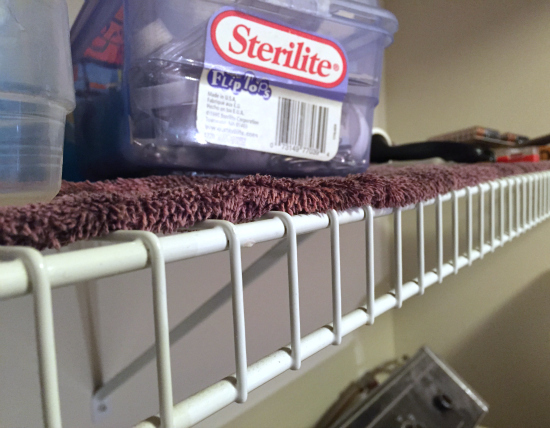 I need a shelf in my laundry room and this is genius! Thanks Karen! If you decide to go with this idea (or any idea really), I’d love to see what you come up with. yes, i was waiting for this post today! I would have never thought of fence posts, but the thickness is perfect! Are you able to share how many dowels you used per post to attach? I was thinking 3, but figured you may have found a different number to be sufficient. I was SO happy that my husband pointed out how well the fence posts would work, and I think they turned out better than I could have hoped for. In answer to your question, I believe we used 5 dowels in between each post, but you could certainly adjust that number depending on the length of the shelf. Have a great day Lisa! 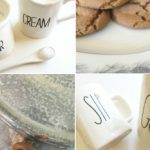 I love this DIY and may have to copy it! 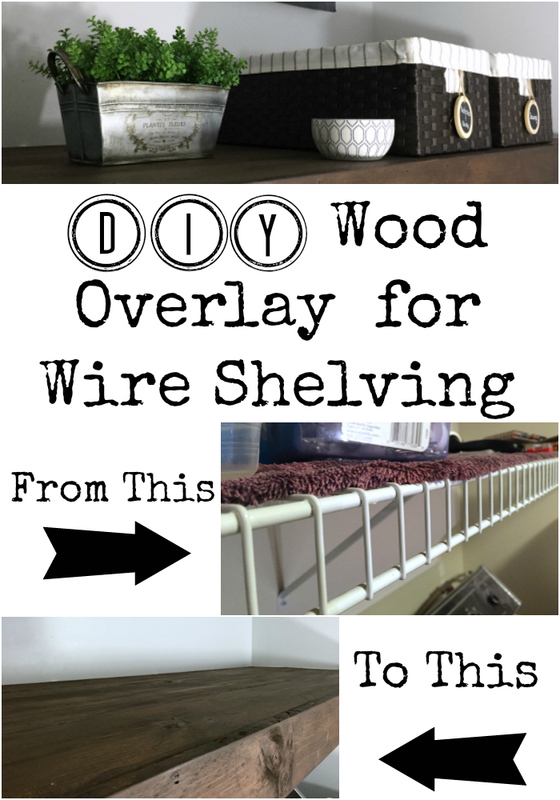 I have been wanting to cover my wire pantry shelves for years. Great job! Thanks Melanie! It was a pretty easy project and made a world of difference! 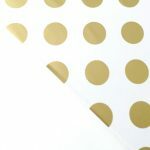 Hi, Erin ~ You and I must be on the same wavelength, because I was just sifting through different ideas for how to cover our ugly wire shelving. Your idea is my favorite! It’s so beautiful, and I love anything wood. I’m pinning this to refer to when we redo our messy and ugly hall closet. Thanks for sharing and awesome job! Hi Erin: re you “not understanding wire shelving”, back in the mid-80’s building boom in Ontario, we bought a new build & wire shelving was a considerable added “extra” cost to the basic house price. Many preferred it over wood as it was felt there was better air circulation in closets – especially linen cupboards. I no longer have “male help” in cutting wood, etc. so I painted clean cardboard with white acrylic (to blend with the wire) and lay that down before stacking clothing on top, thus, no ridges on my clothes. I like your shelves very much, though, and wish I could do that! That actually makes so much sense, allowing more airflow in closets. Thanks for sharing that. I am actually looking into ideas to cover the wire shelving in our master closet because all my clothes have wire imprints; not sure if I’ll do wood again or try something different. Yes, it’s funny to see what was so sought after in the 80’s is now considered a nuisance but as I said, it was much desired then and was expensive when buying a new house. Since I’m now a widow, I’ll have to stick with the cardboard idea. This is SO incredibly clever and crafty Erin! Great work.